Although there's not much scientific evidence to support this claim, space and time seem to operate a bit differently in Los Angeles. Maybe it's the movie industry that leaves a strange film over the city, where spaces aren't what they claim to be and time starts and stops and runs on infinite loop. It could be the weather that never seems to change and that ever-blue sky that looks suspiciously like a screen, only adjusting slightly when too many people catch onto its uncanny perfection. It could be how much time Angelenos spend in their homes, which shift ever so slightly between banal and -- haunted? Or maybe it's all the time people spend looking in mirrors, those symbols of vanity with potential to be so much more. Although she wasn't born there, Samara Golden speaks the language of Los Angeles. 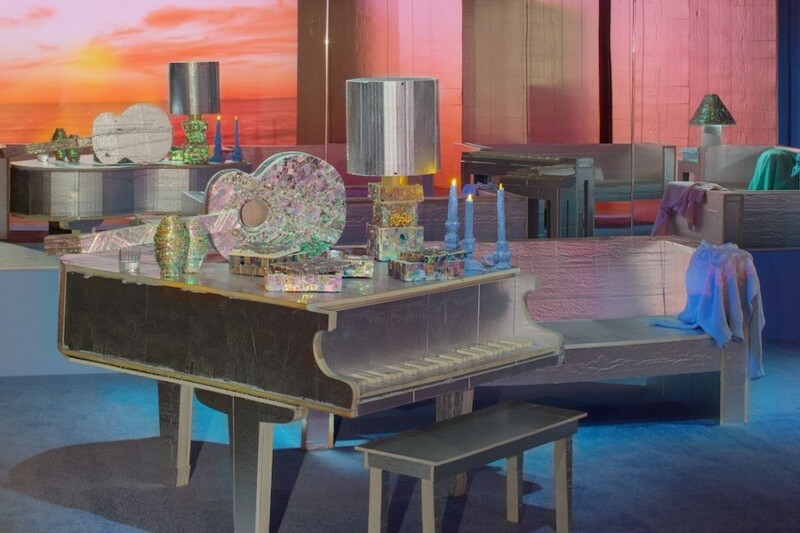 The interdisciplinary artist crafts immersive spaces from video, sound, ink-jet prints, foam, insulation, old sheets and blankets, 3D glasses, printouts from Amazon and eBay, heat lamps, pianos, clay potato chips, candles, paint, glue, and heaps of thrift store finds. And mirrors, lots of mirrors, smashed and broken and leading into spaces that aren't really there. Golden creates disorienting sets that incessantly teeter between real and imagined; remembered and hallucinated; past, present and future. Built from Golden's personal experiences, anxieties and emotions, her works transform from hyper-specific to bizarrely universal. Experiencing her art feels like having a visceral nightmare you're sure is utterly unique, until you find all the symbols listed ever so neatly in a dream guide. Golden was born in Ann Arbor, Michigan, and lived in Minneapolis, San Francisco, Chicago, Austin, Portland and New York, where she received her MFA from Columbia University, all before coming to Los Angeles. "I always wanted to move here," Golden explained to The Huffington Post. "I had a big fantasy about how beautiful and wonderful it was going to be. I guess I watched a lot of '70s movies and TV shows -- I grew up in the '70s -- and all of it was set in California." Although most films and television series were created in L.A., far less actually take place in L.A., leaving the strange impression that the whole city is, in a way, playing pretend. It's not quite what it claims to be. Mirrors, similarly, are never quite trustworthy in their depictions. As Andrew Berardini wrote in a Golden review: "Objects in mirror are closer than they appear." When entering a Golden piece you're immersing yourself in an otherworldly scene of similar logic, a cacophony of discordant times, places and feelings jumbled up, one on top of the other, beginning to melt. 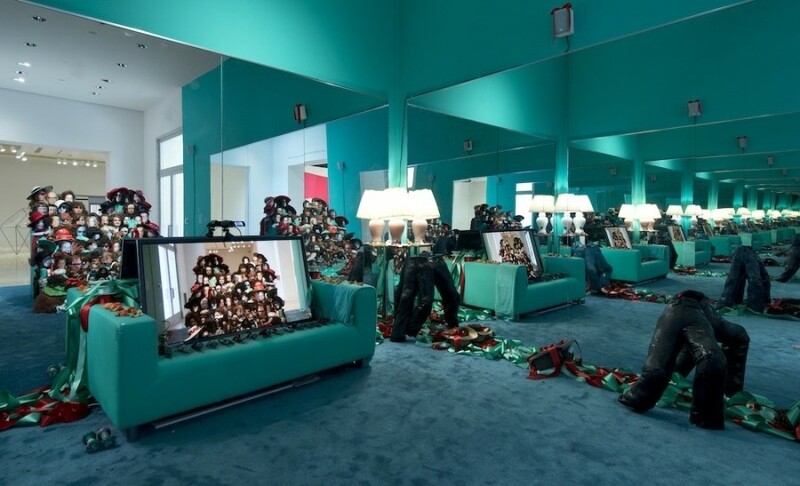 Her installation "Thank You" is currently on view in the "Made in L.A., 2014" biennial at the Hammer Museum. A partially mirrored room is painted a painfully pungent aquamarine, with a carpet and couch to match. There are mirrors and screens everywhere, playing the replaying the viewing in real(ish) time. In the center of the space is a clumped mass of thrift store dolls, altered with clay and hair to resemble people Golden knows. To see the flattened faces, viewers need 3D glasses, enacting a reality that exceeds three dimensions. If you stand behind the doll huddle, you can actually see yourself become one of the heads. Samara Golden, "Thank you". Made in L.A. 2014. Installation view at the Hammer Museum, Los Angeles. June 15-September 7, 2014. Photography by Brian Forrest. "You're supposed to be able to be part of the thing," Golden said. "But at the same time I wanted it to be like when you're dreaming and everything is really dim and you look in your peripheral vision and you see a vision of something that's surreal and scary, and you look back and it's not there. I wanted to create that idea with the 3D glasses, so when seeing everybody it's like you were seeing something more than realistic but also these not-there figures. Like ghosts I guess, but I hate the word ghosts. Apparitions." At the biennial's opening, viewers swarmed to the mirrors and cameras, so much so that it was impossible to tell if more were concerned with the artistic reflections or their own. The selfies and silly faces added to the horror of the dollhouse gone awry. Carolina Miranda said of the work: "Definitely a piece that makes you go, Duuuuude." Golden's works employ a particularly disorienting all-at-once-ness she's referred to as the sixth dimension. As most people know, the first three dimensions are spacial, the fourth is temporal. "In the fifth dimension, linear time, you can time travel from the past to the present and the future and it all happens in a linear way," Golden explains. "The sixth dimension is more like this idea that there are a million dimensions from the past, a million from the present and a million from the future all existing at the same time." It's an idea that, for Golden, is deeply personal, and too confusing to express in any way besides art. "The works are a way that I found to talk about an idea that's deeper, that I'm not sure how to describe." That's where the mirrors come in. "For me, mirrors are this portal to another reality. I feel like the things I want to make can't possibly be made on earth, with the tools that we have and limits of the physical world. I really like the way that mirrors allow for a more confusing understanding of what's happening. Forever, I was trying to illustrate confusion and I feel like mirrors are a tool to complicate things or create spaces where there really isn't space." For all their contemporary associations with vanity and boredom, mirrors remain one of the few examples of mass-produced magic. The smallest mirrors reflect the largest of spaces. As Clarice Lispector writes in Agua Viva: "Take away frame or contours and it spreads, as water pours." When a mirror is incorporated into an artwork, the world is invited into the piece -- every visitor, iPhone, museum guard and cleaning crew becomes part of the art. There's not even the possibility of a right way to see the work, a single vantage point from which to gaze. "We look at ourselves in the mirror on the inside of the door, we always look at ourselves in an inconvenient light because the wardrobe is never in the right place," Lispector writes. Every view is necessarily askew. Like a boundless mirror, Golden's works have no beginning, middle or end. The only thing you'll undoubtably notice in the work is your own reflection. Through her use of mirrors, Golden does relinquish authority over her works, but then again, she does this anyway. Though some pieces were made in the hopes of viewers donning 3D glasses, posing before the camera, or reading the text as it scrolls overhead, she's not too concerned with the specifics of each interaction. "I have to use all these really specific aspects in order for the work to build up meaning. But once it's made, I'm not interested in manipulating people at all. I hope it can be powerful for them in a really different way than it's powerful for me." Samara Golden. The Fireplace, MOCA, Los Angeles, 2013 Installation shot. Golden has likened the power of her art-making practice to a kind of exorcism, a physical expulsion of darkness from the body. 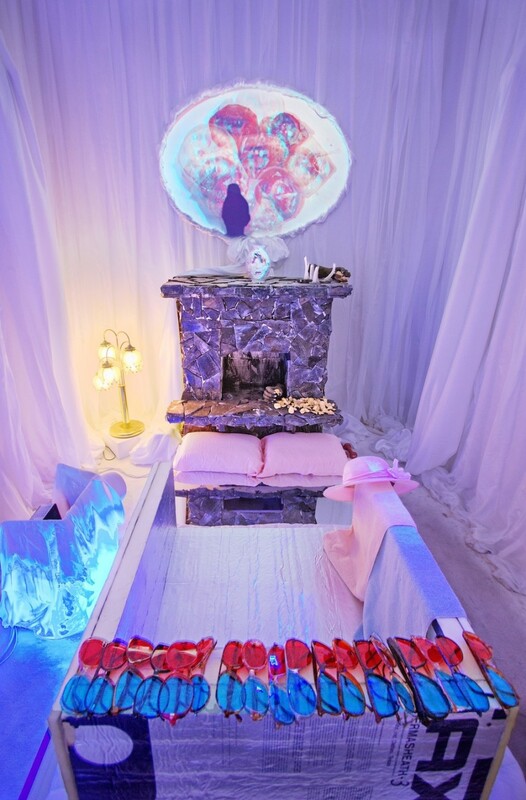 Her installation at MOCA, "The Fireplace," features an armchair facing a fireplace, while iPhone photos are rapidly flashed onto a projected plane. Three-dimensional glasses turn the white room into a red and blue funhouse. A mirror on the floor projects a stream-of-consciousness flood of text onto the ceiling, flowing like the frantic ramblings of a brain that can't get to bed. Golden described to Interview: "The piece is about me being overwhelmed; being an insomniac, plaguing oneself with thoughts, and also having migraines. It's a shadow." Yet through the creation of the piece, Golden freed herself from many of the problems that inspired it. "For the piece at MOCA, the work ended up being about a lot of anxiety, insomnia, cyclical thinking, bad thoughts. I thought of making a piece as a way of getting all those things outside of me, materializing them all. The process of doing that became a magical way of ridding myself of them or casting them out. They say in religion and psychology that, if you're having a lot of problems with something, you should write down your thoughts and them burn them. To me that's an exorcism. I don't mean it in the Catholic sense. It's this idea of making the thing and after it has totally manifested it has no power over you anymore." Samara Golden creates spaces that don't quite exist anywhere else. They're made of glass and junk from Goodwill and the faces of strangers and friends. And yourself, always yourself. Most elements aren't visible or invisible, but somewhere in between. They don't adhere to the laws of time and space we're accustomed to. Photography feels stuck in the past, sculpture is in the present and video has yet to be determined -- it's time travel. Though it's tempting to describe Golden's artistic domain as otherworldly, we find a lot of her particular brand of magic-making here on planet earth, here in Los Angeles. In the alien skies, the looming cameras, the abandoned movie sets trapped in another era. In the anxiety and the spirituality and the tackiness and the hot nights and the ethereal beauty that seems both frozen and infinite. Golden holds up a mirror to L.A., and it's a reflection that's ever so slightly aslant. 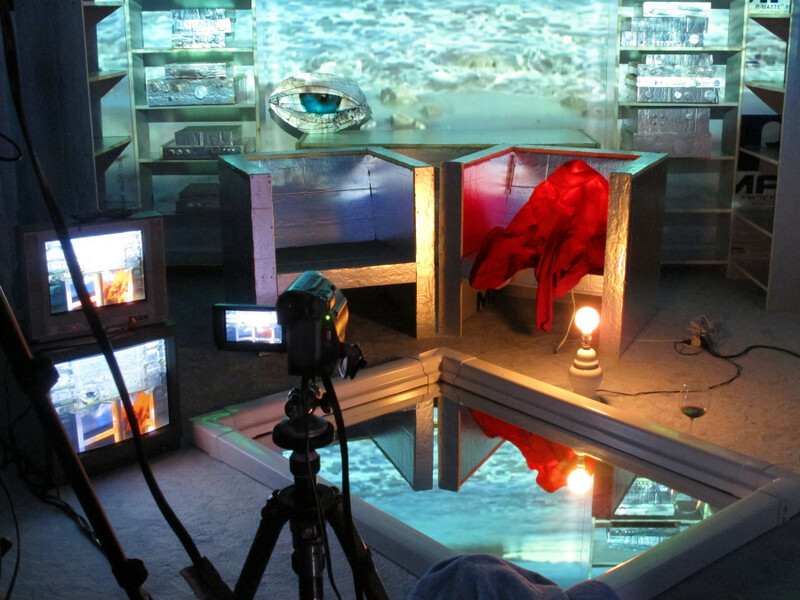 Golden's work will be shown in an upcoming exhibition at MoMA PS1 this October. Samara Golden. Bad Brains, Frieze Fair NY, 2012 Installation shot.